Puppies are purposefully bred for temperament, soundness, trainability and correct conformation. In more simple terms - our labradors look, act and move like labradors should. We only breed a few litters per year. We take care in ensuring we are using credible bloodlines that represent the type of Labrador Retriever we believe are conformationally correct and have the right attitude for both showing, and becoming great family members. We use both line breeding (common ancestors between both parents) and outcrossing (two separate families) depending on the individual pedigrees and characteristics of our breeding stock. Our aim is to produce confident and curious puppies who are conditioned to relate to people and want to learn and explore. While Labrador puppies are naturally bright and friendly, raising them in an enriching environment enhances their desire to please their human family and boosts their confidence in new situations. From birth our puppies are held, stroked, and touched on their feet, bellies and faces. From three weeks of age our puppies are introduced to small toys of differing textures, listen to audio soundtracks and the radio and are handled readily. When they are up on their feet they are encouraged to explore the outdoors, are given tunnels to play in and a balance dome to think about their four feet and challenging themselves. These experiences build confidence and help them adjust to new situations. Socialisation is also very important and our puppies are handled by various family and friends, children of differing ages and are able to play with our trustworthy mature members of the Labrador Family. We have two very cheeky cats who offer their teasing services and have min goats and horses walking around nearby. Puppies that are use to activity and various types of animals are more able to cope when they join their new family with new environments and other pets already in the home. We also give our puppies opportunities to prepare themselves for their new homes, such as having car rides, wearing collars, taking baths and eating a variety of premium foods. Puppies receive a temporary C4 vaccination and a microchip at six weeks of age, and a thorough Veterinary examination. They are wormed at two week intervals from two weeks of age. Our puppies will never have fleas and are clean, well grown and beautiful. 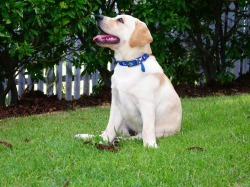 We will guarantee that our puppies are physically healthy at the time they leave us at eight weeks of age. Our Labradors are pedigree dogs. That means we are registered breeders and our Labradors have registration papers issued by Dogs Queensland (formerly the Canine Control Council Queensland). Most Miandor puppies are sold on the Limited Register. This means that new owners have proof that their Labrador is pedigree bred, but they cannot breed registrable puppies or conformation show our stock. This is for the protection of our own breeding program, and is one measure we can take to ensure that only the best of our stock continues within future breeding programs. Obtaining a puppy on the main register may be negotiated (depending on the availability and potential of individual pups) if it is your desire to own a show dog, become a Labrador breeder, or are already a registered breeder. Miandor puppies are ready to join their new families from eight weeks of age. They will leave home with information about their diet, appropriate exercise and supervision during development, their health information - such as vaccination, heartworm prevention and intestinal worming dates, a copy of their parents' mandatory health test results, and a transfer of registration to their new owners. We encourage our puppy owners to keep in contact with us as their puppy grows, and to always feel welcome to ask questions or acquire further information on puppy development, health needs and training. We offer life time support to our puppy owners - which could be 12-16 years! As responsible breeders, we continue to care about the puppies we have bred and we will assist where we can. This includes helping with rehoming should there ever be circumstances requiring a new home to be found. Our puppies are first and foremost bred to continue on our conformation show lines. This means that puppies are assessed over eight weeks, or longer if required, for us to choose one and sometimes more, as suitable show and breeding prospects. Due to this ongoing assessment we do not have families 'pick out' their puppy from the remaining litter. Puppies are allocated to our confirmed families based on the families' preference for colour and gender and our matching of temperament to specific family dynamics. For example, a family with small children requires a confident but sensible puppy who will take direction easily and does not have high energy levels. As we spend so much time with our puppies, we get to know them very well. We can advise families on the developing temperaments of each puppy and the type of guidance they will need as they grow. Are you prepared to invest 12-15 years in caring for your Labrador? Have you researched the health requirements, such as correct diet, exercise, Hips/Elbows/Eyes? Are you prepared for a long term financial investment such as yearly vaccinations, heartworm treatment, flea treatment, quality food, and desexing fees? Can you afford additional vet bills if an accident were to happen? Do you have an appropriate home environment including dog proof fencing? Have you considered the training requirements for managing a young and energetic Labrador? (remembering that they are slow to mature and very active for the first 3 - 4 years). Labradors are an intelligent breed that like to keep their minds working - can you provide enough stimulation for a growing and active Labrador? If you are an interested puppy buyer and would like further information on any of the above please feel most welcome to contact us. We're more than happy to answer any of your questions!